The gloves are made of full grain, chrome tanned leather. The leather is treated with a water resistant compound. The gloves are black, slip-on style, all leather, with a buckle strap of black tape on back of glove for wrist closure. 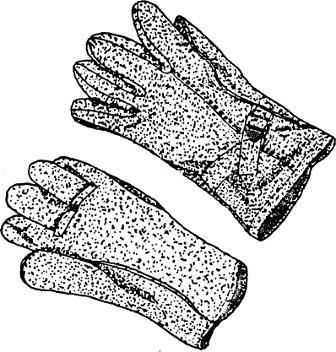 The gloves are either a one-piece back and front or a two-piece back design.